A lovely, reclaimed, reproduction cast iron fire basket with integrated fireback. The firebasket is heavily decorated in a style traditional to antique firebaskets. 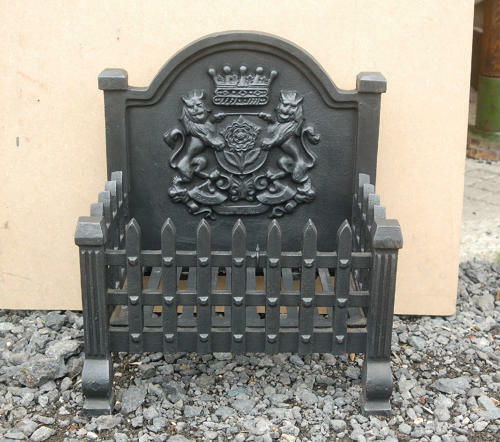 The back has a decorative crest with lions, tudor rose and crown and the grill sides have heavy spikes and finials to the top of the legs. The firebasket is very heavy and robust and the casting is of a good quality. The firebasket is reclaimed and has some very slight signs of use, wear and very small patches of surface rust. There is rust to the reverse of the backplate and there are a few casting marks. The cast iron has been blacked and polished and has a nice finish. The basket is of a good size and would work very well in a period style home. A quality and desireable item.